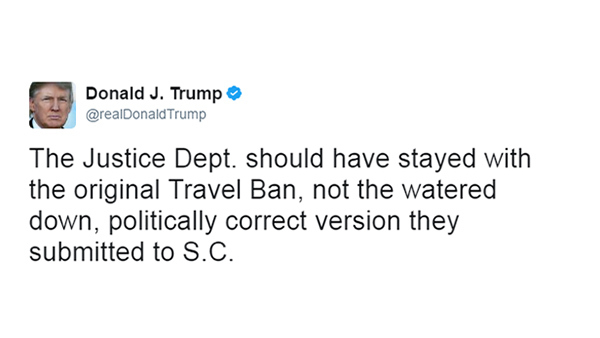 WASHINGTON -- President Donald Trump lashed out at his own Justice Department Monday for seeking the Supreme Court's backing for a "watered down, politically correct version" of the travel ban he signed in March instead of pursuing a broader directive that was also blocked by the courts. It's unclear whether the president has conveyed his requests to the Justice Department, which he oversees, in a forum other than Twitter. The White House did not immediately respond to requests for that information and the Justice Department declined to comment. The president has intensified his push for the travel ban in the wake of the vehicle and knife attack in London that left seven people dead and dozens injured. The Islamic State has claimed responsibility for the attack. Trump's Twitter barrage risked undercutting his administration's legal arguments in support of presidential directive, which he argues is crucial to safeguarding American security. The administration's lawyers and White House spokesman Sean Spicer have argued that the executive order has no connection to Trump's campaign calls for a temporary "Muslim ban" and have disputed the characterization of the order as a travel ban. Yet the president on Monday said the order was exactly that. "People, the lawyers and the courts can call it whatever they want, but I am calling it what we need and what it is, a TRAVEL BAN!" he wrote on Twitter. Trump has used attacks around the world to justify his pursuit of the travel and immigration ban, one of his first acts since taking office. The original order, which was signed at the end of his first week in office, was hastily unveiled without significant input from top Trump national security advisers or the agencies tasked with implementing the order. It was not immediately known when the Supreme Court will make its decision on whether to hear the case.